Another wonderful part of a gathering of Stampin’ Up! demonstrators is of course the amazing creativity that surrounds you! Of course, we love to share what we do, so that’s what we do – we make cards & projects, and swap them! I participated in 3 ‘organized’ swaps; that’s where everyone signs up ahead of time, so we know how many cards/projects we need to make. 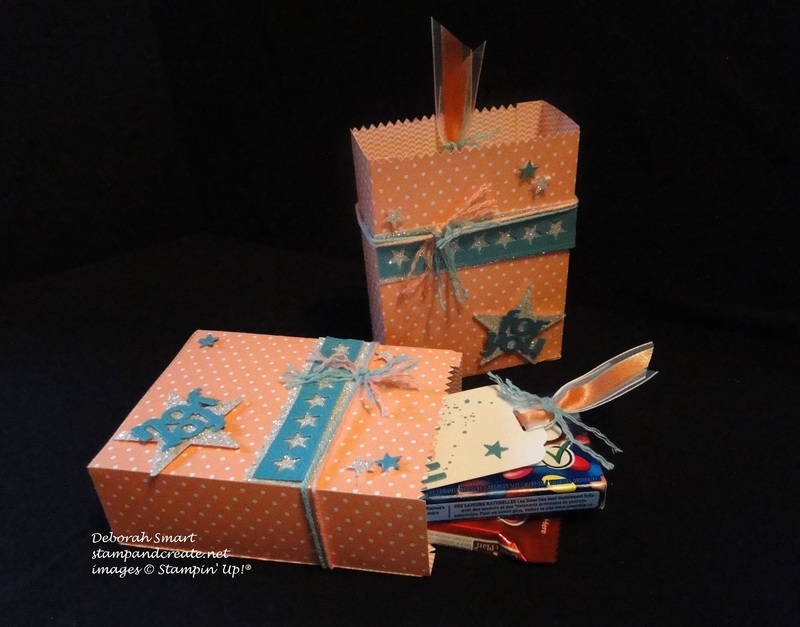 I did 2 card swaps, and a swap using the Mini Gift Bag die. I just love the Butterfly Basics bundle! (say that 3 times fast 🙂 ) For this card, I stamped the fern in Pear Pizzazz times – 1st time full strength, then the other 2 times without adding any more ink on the stamp (‘stamping off’ technique) on Very Vanilla card stock. The borders and sentiment were stamped in Blackberry Bliss. I layered this stamped panel on top of a panel of Blackberry Bliss card stock, and attached that to a card base of Very Vanilla card stock. Using the Butterfly Thinlits Dies, I cut the largest butterfly from Brushed Gold card stock. I stamped the medium butterfly in Blackberry Bliss ink onto Vellum card stock, and used the thinlit die to cut it out, and layered it onto the large butterfly with a Stampin’ Dimensional. 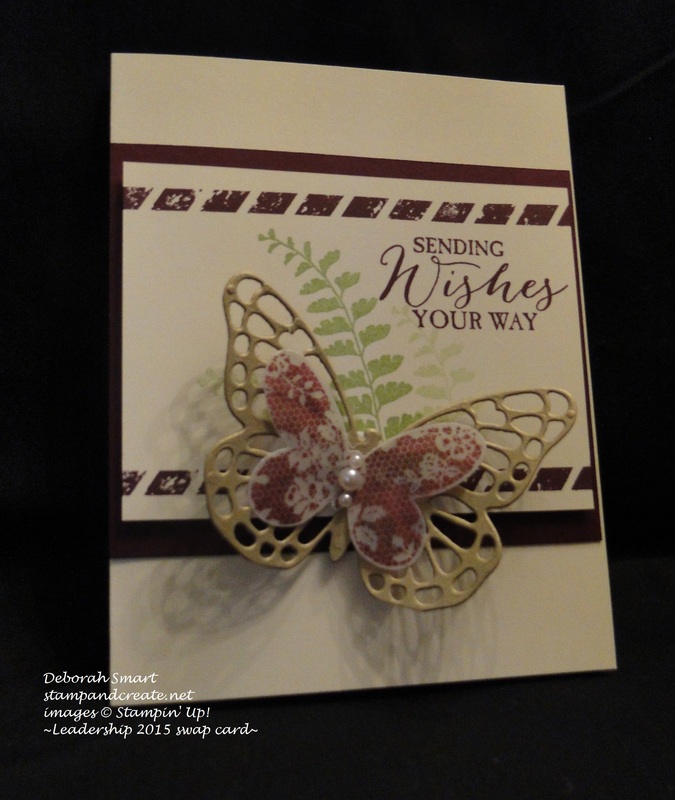 I attached the butterflies to the card with another Dimensional, and added 3 Basic Pearl embellishments in the body of the butterfly to complete the card. For the Treat Bag, I used the 2013-2015 In Colours Paper Stacks in Crisp Cantaloupe. The piece at the bottom of the tag is a piece of scrap left after cutting the bag! No DSP goes to waste! 🙂 All of the embellishments on the bag, except for the Baker’s Twine, are included in this dies set – that’s how awesome it is! 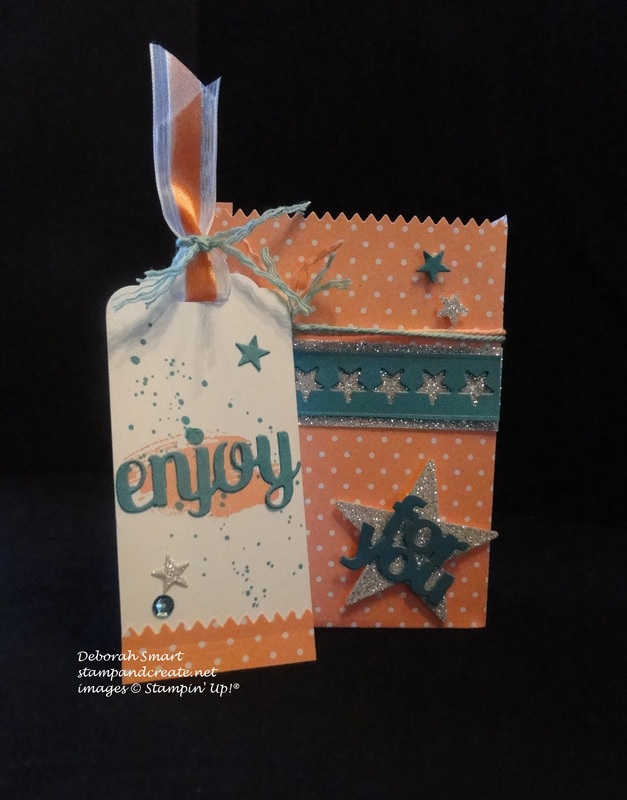 The border of stars was cut using Bermuda Bay card stock, layered on top of a strip of Silver Glimmer card stock. I cut the large star from Silver Glimmer Paper, and used the cut out smaller stars to decorate both the bag and the tag (remember what I said about no wasting?!) Both the ‘for you’ and the ‘enjoy’ are also included in this die set – let me tell you, I am going to get A LOT of use from this incredible set! 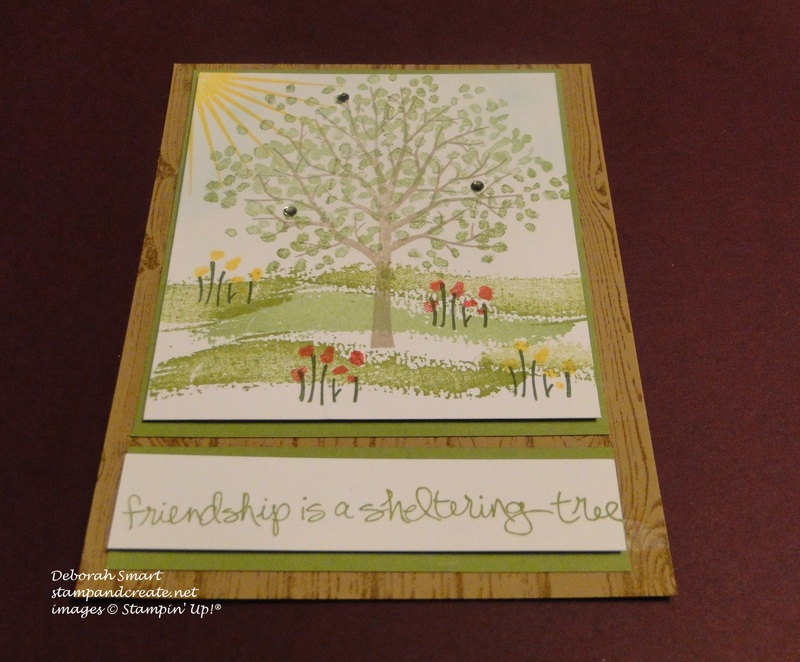 This Sheltering Tree stamp set is so versatile – the most difficult part was deciding which parts of the set I wanted to use! As a lot of people are getting rather tired of winter, I decided to go with a spring theme. I created my card base on Baked Brown Sugar card stock, stamped with the Hardwood background stamp in Baked Brown Sugar ink. The image and sentiment were stamped onto Whispering White card stock. The beauty of this set in photopolymer is that it is so very easy to later the leaves over the tree trunk, and the flowers on top of the stems – without using a Stamp-a-ma-jig! I used Pear Pizzazz and Old Olive inks for the grass; the tree trunk was stamped in Baked Brown Sugar, and the leaves & sentiment were stamped in Old Olive ink. For the flower stems, I went with Mossy Meadow ink, and the flowers were stamped in Daffodil Delight and Strawberry Slush. I lightly sponged Soft Sky ink behind the tree to create a sky, and used the sun image from the Kinda Eclectic stamp set. I layered the stamped pieces onto Old Olive card stock, and attached them to the card base. A few sequins to brighten the tree, and the card was finished. 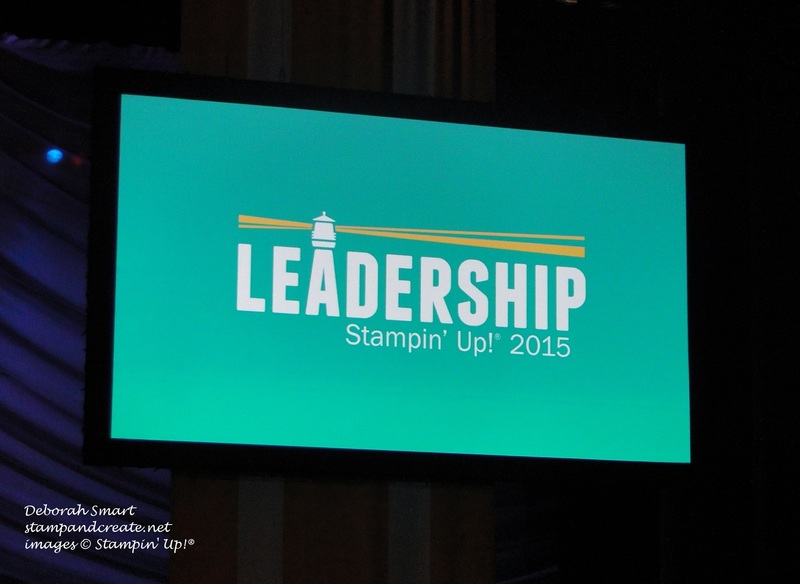 If you would like to be a part of the Stampin’ Up! family, and a part of my team, to have the opportunity to share what you love to do with like-minded people, I hope you’ll join us! 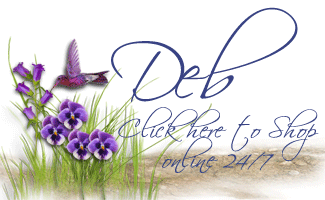 For more details on the terrific extras you get for signing up during Sale-a-bration, you can go direct to my sign-up site HERE – read the information, the click ‘Join Now’ to start your new adventure. Of course, please contact me at debsmart@shaw.ca or 604.298.0472 if you have any questions.